I’ve been using Cat’s Claw for about a good year. In fact at the 2009 Sea Otter Classic, we met up with the Cat’s Claw people and they gave me a free bottle to try out for a review. On the Internet, you can easily find Cat’s Claw priced around $14-$17 for a pack of 3. I have used this product for aches and pains on my HUGE muscles. 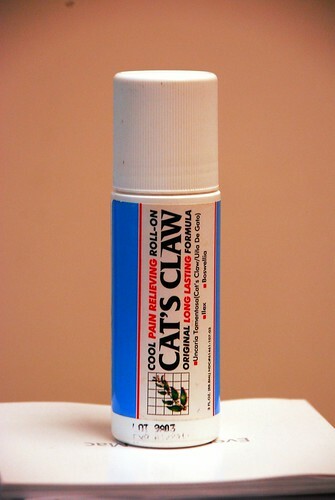 Cats Claw is a clear, greaseless, topical cool pain relieving gel containing a higher percentage of menthol (4.5%) and a unique herbal blend of Uncaria Tomentosa (Cats Claw / Ua De Gato), Boswellia, and Ilex, which sets it apart from its competitors Cats Claw Topical Cool Pain Relieving Gel provides fast, long lasting relief from minor pains and aches associated with strenuous exercise, daily activities, sore muscles and the stresses of life. Effective pain relief for Arthritis, Neck Pain, Shoulder Pain, Back Pain, Painful Joints, Sore Muscles, Muscle Sprains & Spasms. * Long Lasting formula with ILEX, Boswellia & Uncaria Tomentosa. * Effective pain relief for Arthritis, Neck Pain, Shoulder Pain, Back Pain, Painful Joints, Sore Muscles, Muscle Sprains & Spasms. * Provides fast, long lasting relief from minor pains and aches associated with strenuous exercise, daily activities, sore muscles and the stresses of life. * Popular hands-free roll-on dispenses product directly on sore muscles and joints. 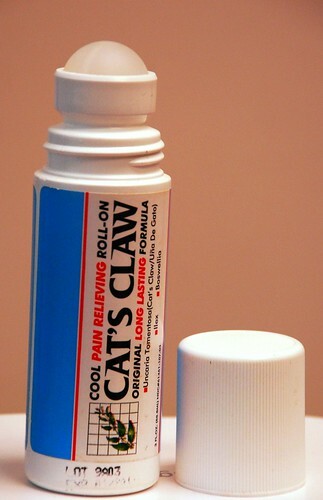 When I tore my left calf muscle, I relied heavily on Cat’s Claw to make me feel better. It’s not a drug like Ibuprofen or Acetaminophen, but more topical ointment like Ben-Gay. It has a nice menthol smell, but not over powering where you stink like old people. It’s pretty mild and even pleasant. What I liked about the Cat’s Claw is that it was a roll on. I’ve used stuff like Icy Hot and Ben-Gay, they can get pretty messy and greasy. The Cat’s Claw just rolls on the area that you need to feel better, and there’s no mess to clean off your hands. Cat’s Claw works all over your body. But I wouldn’t put it on your privates or near the eyes and mouth. For me I primarily used it on my knees, quads, and calves. The only weakness I found on it was that on average, the “healing powers” would only last about 1.5 hours. Once I feel it wearing off, then I’d have to reapply. Would I recommend it? Sure why not. It works, I like the fact that you don’t have to get messy when putting this stuff on. But here’s the bummer part about Cat’s Claw, I’ve yet to see it at Target or Wal-Mart. But for about the same price as Cat’s Claw, Icy Hot has a similar product that sells for about $4-$5 and yes, its also a roll on. I guess if you can find Cat’s Claw I’d recommend getting it. If you can’t, then Icy Hot would be the next best thing. Is that like tiger balm? but just the claws? Sounds like a product that I have been using called Bio-freez. Good stuff! Can only find it at my chiropractor’s office.